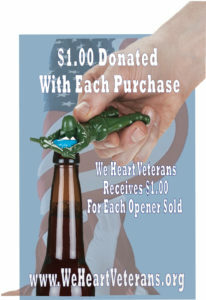 We Heart Veterans is a local 501c(3) non-profit, who helps aging wartime Veterans, as well as their widows; (1) Obtain medical services to improve their quality of life (2) Bring local and national attention to problems Veterans face every day (3) Show Veterans our appreciation for their sacrifice. We offer services through a network of professionals who understand the importance of serving those who have served. Our main goal is to give our Veterans a higher quality of life in a respectful and caring manner. However, our commitment to helping our Veterans doesn’t stop there! We continue to serve through Projects, such as Ramps for Independence, The Gift of Sound and Never Forget. Due to your generous donations, we are able to announce the addition of 3 more Veterans we are able to provide non-medical home care services to! If you are not part of our family, please consider becoming a member NOW! We have made it our mission to make these services available to all our service men and women that are in need. If you or a loved one is a Veteran in need, please contact us today.